Florida Teak has just received a large shipment of Tongue & Groove Teak Flooring and is offering very good pricing on this high-quality product. The planks are unfinished, so they may be finished in any way the client prefers, opening a world of possibilities. Don’t miss this rare opportunity to acquire real, sustainably grown teak flooring for your home. A flooring that will last more than a lifetime! Current stock is 3/4″ thick x 6″ wide and can be cut to your preferred length. Due to frequent request, we now carry sustainably farmed plantation-teak from South-America and Africa that is best-suited for flooring. 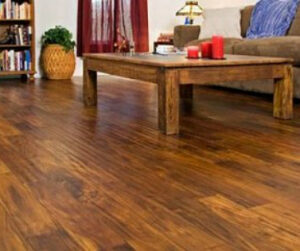 This teak has more “character” than Burmese old-growth teak, and for residential flooring it adds beauty and aesthetics. This is a more cost-effective way to obtain the look and character that only teak wood can provide. Plantation teak is not a good choice for outdoor and marine applications but is perfect for indoor applications, especially for finished flooring. This teak has much more variation in grain and color and it readily accepts stains and varnishes. It tends to offer a golden to light brown color with dark coffee-brown accents that has a “wavier” grain than old-growth teak. Being from smaller, younger trees, the grain is more defined and apparent, much like oak or mahogany. Like most teak, it is easy to re-finish so it can last for a lifetime.